Newton’s First Law of Motion states that an object will remain at rest or in motion until an outside force acts upon it. 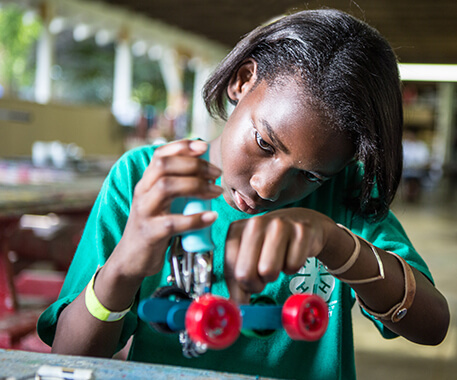 This 4‑H STEM Lab activity uses Hot Wheels cars to explore the concepts of force and friction described by Newton. Youth will manipulate how hard a car is pushed and explore how to maximize the pull of gravity. The below instructions include the steps for exploring force and friction. Use the included charts in the Lab Notebook to record your data. Tip: Assist younger youth with measuring and timing. Have older kids complete the data charts three times and find the averages to ensure reliability, just like real scientists. Connect the launcher to four pieces of straight tracks. Put the car in the launcher and pull it back to the first setting. Repeat this for each of the different settings on the launcher. Remove the launcher from the track. Build a ramp with the first piece of track resting on top of one item (book, movie case, or box). Place the Hot Wheels car at the top of the ramp and release it (do not push). Wait until the car stops. Use the tape measure to measure the distance the car traveled from the bottom of the ramp to the back of the stopped car. Record the distance in the data table included on the Lab Notes page. Repeat steps for a ramp that is two, three and four items tall. Was there a pattern between how fast the car traveled and what launch setting it started at? What pulled the car down the ramp? What made the car slow down to a stop? If you ran another test, how could you increase the car’s distance without raising the height of the ramp? Physics is the science that deals with matter, energy, motion and force. The study of sound, electricity, motion and heat all involve physics. One of the most famous physicists was Sir Isaac Newton, who is best known for discovering gravity when watching an apple fall from a tree, but he also created the three laws of motion. Newton’s First Law states that an object at rest will remain at rest, and that an object in motion will remain in motion unless acted upon by an outside force. Force can be defined as a push or pull that gives energy to an object and causes a change in the motion of that object. In the first activity, the launcher was the force that pushed the car forward down the track. In the second activity, gravity was the force that pulled the car down the ramp. Friction is also considered a force, however it acts in the opposite direction of the motion of an object and causes it to slow down and eventually stop. In both activities, the friction from the carpet, tile, wood floor, or track is what stopped the car. Download and print the Newton's Speedway: Force and Friction PDF to easily complete the activity in groups.